The winter season in the Southern Hemisphere is still clinging to life. Mount Hutt in NZ is reporting snow depths of 65cms on the upper slopes and 55cms on the lower mountain. With the last snowfall being on 3rd October – a nice 5cms blast to freshen conditions up a bit. The hill was closed due to high winds today. The temperature is still below freezing. The webcam shows there is still a nice looking cover of white. Lets hope they manage to rumble past the 12th October proposed mountain shut down date. Most resorts in Australia are now closed. In South America things are fairing a little better with a number of resorts still being open in Chile and Argentina. 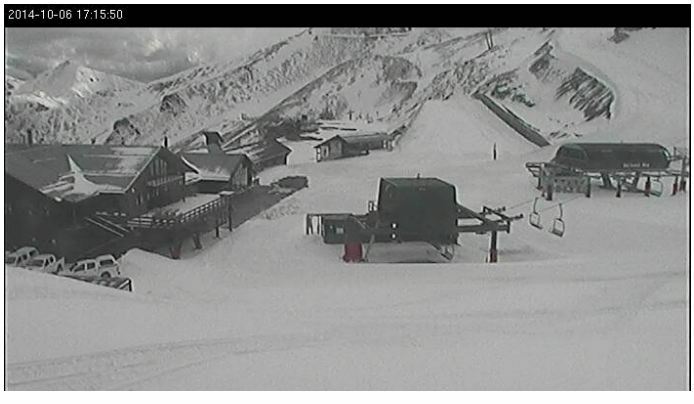 Nevados de Chillan in Chile in particular is reporting a massive snow depth of 340cms! !